Manny Machado will likely be on the move this summer. 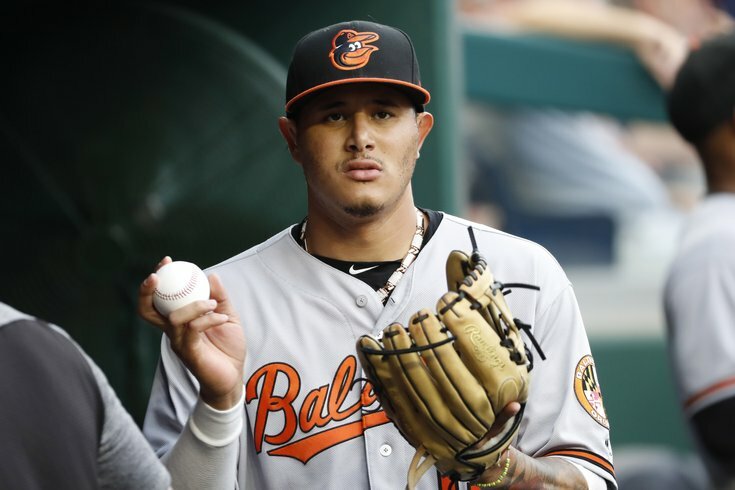 Manny Machado, Orioles shortstop and walking trade rumor, is likely to be traded from Baltimore in the next couple of days. Whether he’ll end up with the Dodgers, the Brewers, or right here in Philadelphia is yet to be seen; so many reports from so many sources have come in and out of the non-stop Twitter rumor mill that it’s hard to discern fact from fiction. MORE MLB RUMORS: Is a Manny Machado trade to Phillies imminent? Which is why the Philly sports fans subsection of Twitter, which never sleeps, has turned the Unverifiable Twitter Rumor into an art form. It began with the courtship of LeBron James, when rumors swirled about the superstar scouting Malvern Prep for his sons ahead of a potential free agency move to the Sixers. That didn’t pan out. Just saw Manny Machado on SEPTA riding the 17 bus to South Philly. It was super crowded & he had to yell, "🗣 BACKDOOR!" to finally get off. He was wearing a bootleg "Wentzylvania" shirt & eating Tastykake Butterscotch Krimpets on his way to CBP. Shamus Clancy’s Machado sighting might be the ground zero and the height: this touches on public transportation, another local sports team, the city’s bustling knockoff tee shirt market, local foodstuffs, and the blue-collar ethos (riding the bus to work!) that made Connor Barwin a Philly hero for a few years. Start building the statue. Twitter user CJ finds Machado dipping his toes into the Jersey Shore waters. Just saw Manny Machado at 23rd & Berks blasting Flamerz 3, asking “Where Meek At”? If Machado is reaching back to 2010-era Meek Mill, he’ll probably be more than just a three-month rental. 1. Good choice of cheesesteak from the newest Phillie. 2. The Bobby Clarke jersey is a nice vintage touch. 3. The Eagles won the Super Bowl, 41-33, over the New England Patriots. Just saw Manny Machado at Wawa in Doylestown wearing a sleeveless Villanova T-shirt. This one could be good or bad, depending on your feelings about the Villanova-as-Philadelphia school debate. But Wawa is always good. Just saw Manny Machado outside Jason Kelce's apartment picking up an underdog mask and Kelce's mummer's costume. Kelce told him that he'll need it come October/November. Machado would be wise to emulate Kelce early in his Phillies career. Outside of Nick Foles, no one’s stature benefited more from the Birds’ Super Bowl run and subsequent celebrations. Just saw Manny Machado at 30th street station dressed like the philly phanatic and he was asking people if Dalessandro’s really lives up to the hype! Dalessandro’s is the “Don’t eat at Pat’s, you tourist” cheesesteak of choice. Plus there’s a good chance Machado and the Phanatic will become good friends: Machado’s having one of the best hitting seasons of his career. Looks like Machado has been reading some local news ahead of the trade. And we’ll end things here, for now. This is another contender for the best all-around scene. John’s Roast Pork is the thinking Philadelphian’s “best sandwich in the city,” so that checks one box. Wawa iced teas are no-brainer purchases. And the combination of riding in on an eagle (41-33) and leaving on a motorcycle? Phillies fans would go nuts. If Machado really is traded to the Phillies in the coming day or two, he's going to have a lot of work to do if he wants to top Mythical Manny's antics.